This Armenian Rice dish is similar to rice pilaf, a side dish that not only is the perfect addition to Salmon, but also the perfect dish to push you outside of your comfort zone. 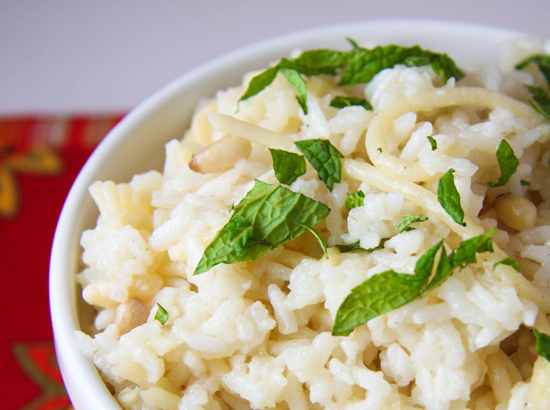 Pasta pieces, pine nuts and rice combine with sprigs of mint for a delicious side. Learn to double the recipe because everyone will want seconds! I made this side dish for the sole purpose of pairing it with my Pomegranate-Glazed Salmon. Because Armenian Rice is what the recipe book recommended I eat the salmon with. 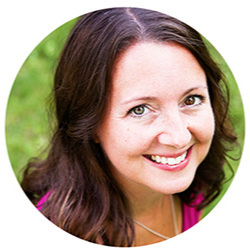 My whole reason for taking on this cooking challenge is to step away from my comfort zone. In the case of this rice dish, I most definitely did that. Never in a hundred years would I have picked this recipe out of a cookbook on my own. When I read through the ingredients, I knew it must be fate. It required the EXACT amount of pine nuts I had sitting on the shelf in my spice cupboard. I refuse to let those expensive nuts go to waste! So, here you go. Armenian Rice. A side dish that helped me to expand my cooking horizons. In a large pot (or skillet), melt 1 1/2 sticks of butter. Cook over high heat until golden brown, about 3 minutes. Cover and cook over low heat for 25 minutes, until the rice is tender and the stock has been absorbed. Uncover, fluff with a fork and cover again. Let stand for 20 minutes. Stir in half of a 1/3 cup of fresh, thinly sliced mint leaves (reserve the other half). Season with salt and pepper. Garnish with the remaining mint and serve! A side dish that no only is the perfect addition to Salmon, but also the perfect dish to push you outside of your comfort zone. This is that cookbook recipe you will no longer skim over! In a large pot, melt the butter. Stir in the vermicelli (or angel hair) and pine nuts and cook over high heat until golden brown, 3 minutes. Stir in the rice. Add the chicken stock, 1 teaspoon of salt and 1 teaspoon of white pepper. Cover and cook over low heat for 25 minutes, until the rice is tender and the stock has been absorbed. Stir in half of the mint; season with salt and pepper. Transfer to a bowl, garnish with the remaining mint and serve.